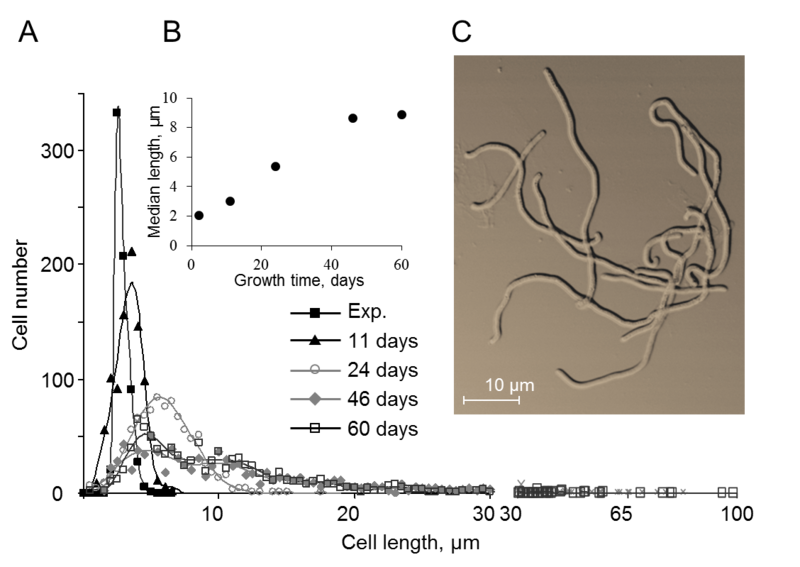 While tightly regulated, bacterial cell morphology may change substantially in response to environmental cues. Here we describe such changes in the cyanobacterium Synechococcus sp. strain PCC7942. Once maintained in stationary phase, these rod-shaped organisms stop dividing and elongate up to 50-fold. Increase in cell length of a thymidine-auxotroph strain upon thymidine starvation implies that inhibition of DNA replication underlies cell elongation. Elongation occurs under conditions of limiting phosphorus but sufficient nitrogen levels. Once proliferative conditions are restored, elongated cells divide asymmetrically instead of exhibiting the typical fission characterized by mid-cell constriction. The progeny are of length characteristic of exponentially growing cells and are proficient of further proliferation. We propose that the ability to elongate under conditions of cytokinesis arrest together with the rapid induction of cell division upon nutrient repletion represents a beneficial cellular mechanism operating under specific nutritional conditions. Cell elongation upon culture aging. A. Distribution of cell length at various times following inoculation. Data points represent the number of cells falling within bins of 0.5mm; trend lines are shown for clarity. Exp. – exponential growth phase (2-day-old cultures). B. Median cell length as a function of time. C. An image of elongated (8-week-old) cells. Scale bar: 10mm. Nutrient-associated elongation and asymmetric division of the cyanobacterium Synechococcus PCC 7942. Goclaw-Binder H, Sendersky E, Shimoni E, Kiss V, Reich Z, Perelman A, Schwarz R.